I've been working for some time on an online colored pencil course that is geared toward stampers wanting to improve their coloring skills using artist quality supplies, techniques, and theories. The class is now open! There are 17 lessons packed with information, instruction, photos, and videos. Students can work through the content at their own pace. The course fee is $65, and you can read a description of the content below. Hope you'll join us! My top recommendations are below. If you have another brand of wax/oil pencil already, that is fine. If you want to read the information in the lessons on pencils first before choosing or ordering the pencils you'll use for the course, that is fine too. I use mainly Polychromos and Prismacolor for my demos and samples. Optional: a solvent and stumps to blend your coloring, or a blending/burnishing pencil. Much more information is given in the lessons about blending methods and supplies - if you want to wait to purchase until after you read that information, no problem. --How long will I have access to the content? Is there a time limit? Nope, no time limit! Take as long as you like. --Will the lessons be available to download so I can print them or use them offline? 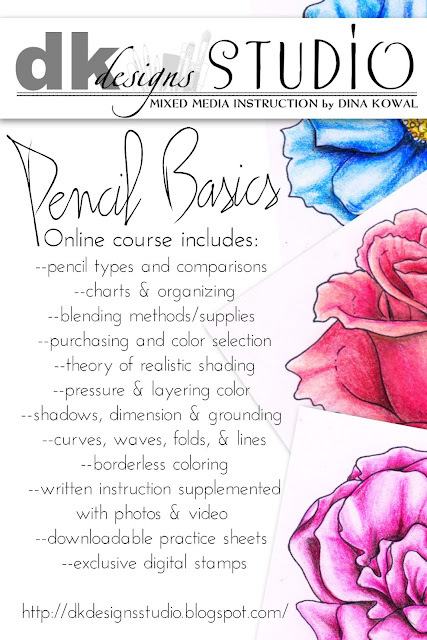 Yes, all the lessons are formatted in pdfs as well as the online class. There are download links for the video content as well. --What if I don't have pencils or other supplies yet? Can I still sign up? No worries! Come on in anyway. The first few lessons are packed full of information about all kinds of pencils, along with colored samples and my personal recommendations, plus links to products you can purchase online. --I don't use Facebook, is that ok? No problem. We're mostly just chatting in there, and participants can share their work and progress if they want. No extra instruction there. The class is hosted on a private Blogspot site, so you'll need a Google ID to be able to sign in. You don't have to use a gmail address, and you don't have to be a blogger. You can find more info about Google ID here. Sounds awesome! Can you start anytime? And do you have access forever to the tutorials or is it for a limited amount of time?